These Lemon Bars are to die for! I don’t bake all that often, cooking is more my thing, but I had plenty of lemons and eggs to use up and this recipe fits the ticket on both counts. 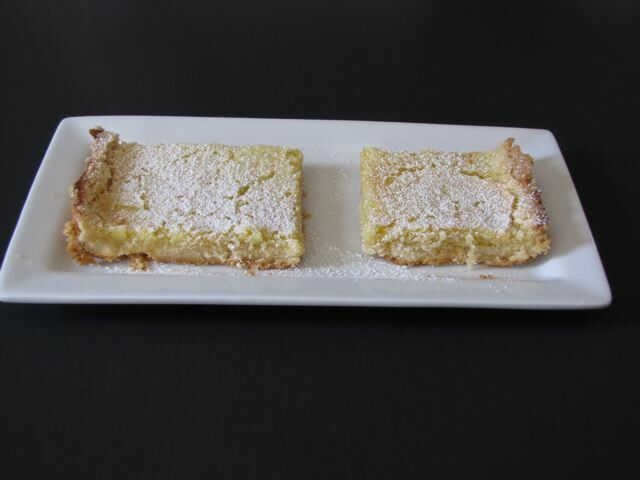 The bottom of the bar is a wonderful tasty shortbread crust and then the lemon egg custard bakes on the top. Sprinkle with powdered sugar and hope they serve this stuff in heaven! I found this recipe in a cookbook I have used in the past for the Ginger Cookies and Blueberry Butter Cake which both are fantastic recipes as well. 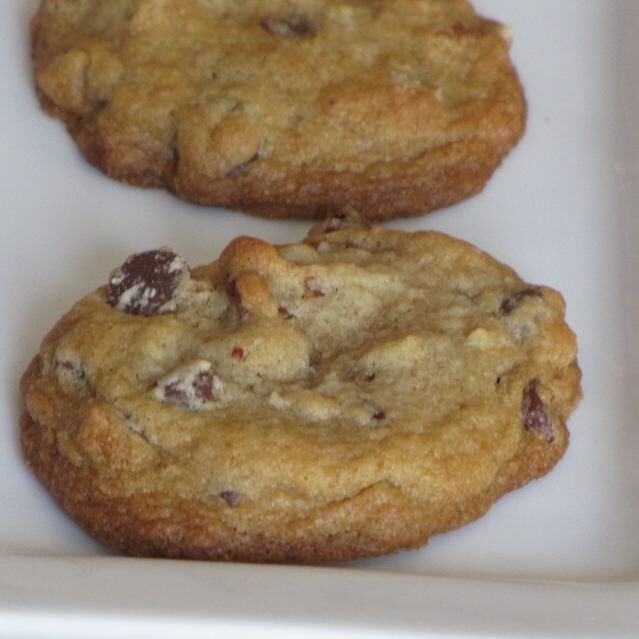 This recipe is another one that does not disappoint! Get the book! 24 squares depending on the size you cut. To make the shortbread crust: cut the butter into smaller pieces. Add the 3/4 cup powdered sugar and 3 cups of flour and the butter to a food processor and pulse until it starts to come together. (It will also change color and become slightly darker than when you started and the crumbs will be more like oatmeal grains) Dump them into the 11x17x1 inch pan and press the crust into the bottom of the un-greased pan. Bake for 18-20 minutes or until golden around the edges (it may not be cooked in the center and it will be perfectly okay). While the crust is baking, mix the filling: Whisk the eggs and sugar together. Add the grated lemonrind and juice and beat for 5 minutes with a hand mixer. The batter will be light and golden and smooth. Combine the flour and baking powder and beat it into the batter just until combined. Pour the filling into the crust (it may be easier to use a ladle to ladle the filling into the pan) Fill right to edge. Bake for 25 minutes. Cool before cutting into squares. Store in the refrigerator. Just before serving dust with additional confectioners sugar. Enjoy. Categories: Baking - Cookies, Dessert - Fruit, Desserts | Tags: Black Dog Restaurant, Lemon Bars, Sue's Luscious Lemon Squares | Permalink. This is my husband’s all time favorite meal. The shame is that veal is not often found in restaurants anymore and many grocery stores stopped carrying it as well. I do find veal at Baron’s Market. My favorite use of veal is for Wiener Schnitzel (Viennese Breaded Veal Cutlets). This week I made Veal Parmesan. 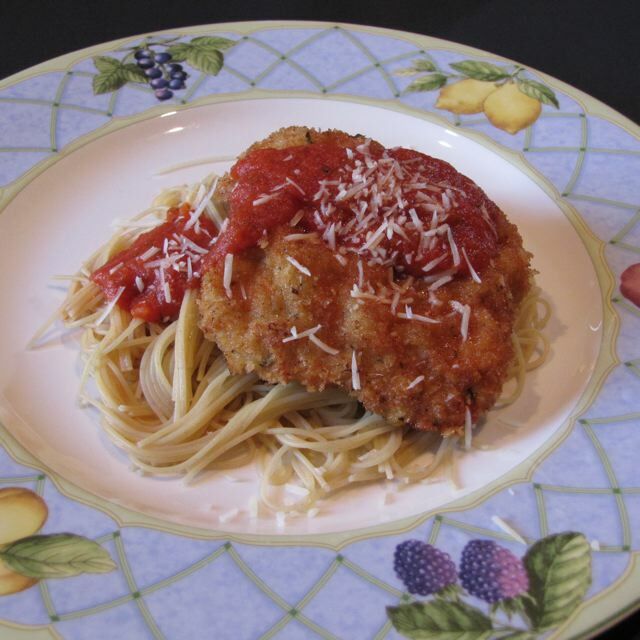 Breaded Veal Cutlets topped with Parmesan Cheese over pasta and served with your favorite spaghetti sauce (I really like Hunt’s Traditional Sauce when I don’t have time to make it from scratch). Bring a large pot of water to boil (for pasta). While the water is heating, pound the veal cutlets until they are thin (1/8 inch). Season the cutlets with salt and pepper, dip in the flour to coat. Shake off excess. Dip in beaten eggs. Coat in breadcrumbs (if you wish stir in about 1/4 cup grated Parmesan into the breadcrumbs). Heat about 1/4 inch canola or Vegetable oil in a large skillet until hot. Start cooking the Pasta in boiling salted water. Fry the cutlets, two at a time, about 2 minutes each side or until golden brown. Remove the cutlets to a platter and cook remaining two. To serve, place a bed of pasta on the plate, drizzle with heated spaghetti sauce. Top with veal cutlet and grated Parmesan cheese. Top with more sauce and more Parmesan cheese. Enjoy. Categories: Ethnic - Italian, Main Dish - Beef | Tags: Veal Parmesan | Permalink. BLTs are the ultimate summer comfort food. I love the ease of preparation and the fact that it contains bacon! What is better than bacon. I’m glad I am not kosher- I would have problems! 🙂 I feel odd posting something as simple as BLTs on my blog. I liked the marble rye that we used on our vacation on the beach. It made for a very pretty presentation – which is why it is on my blog. Toast your bread in the toaster and spread 1 tsp of mayonnaise on one side of each slice (two sides would be overkill). 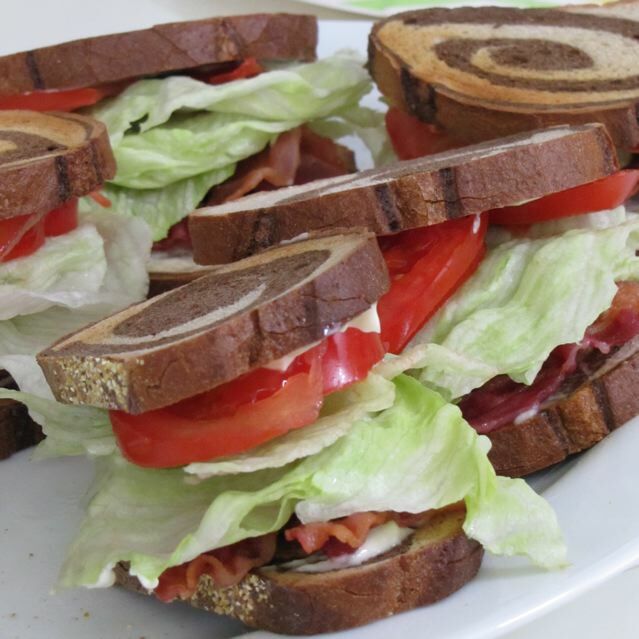 Top 6 slices of toasted bread with two slices of crisp bacon, top with lettuce, two thin slices of tomato and top sandwiches with remaining slices of bread (mayo side down) on top of the tomatoes. Ring the mess hall bell and watch them disappear! Categories: Sandwiches | Tags: Bacon Lettuce Tomato Sandwiches, BLT Sandwiches, BLTs | Permalink. Fresh Pineapple is so delicious and much better than that from a can. After my kids had descended upon my poor pineapple like vultures I managed to save some for muffins. Everyone in my family loves Pineapple Upside Down Cake, and these are a miniature version that is a great substitute unbelievably easy to make. You can use canned if you don’t have fresh pineapple on hand, but fresh is extra good. Line the muffin tin with foil cupcake liners. 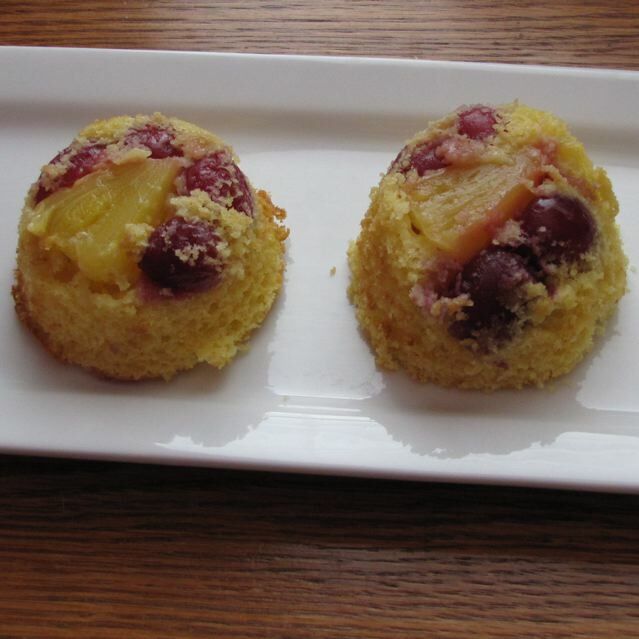 Place a piece of pineapple in each muffin and add four cherry halves to each. Pour the prepared cake mix on top, filling 3/4 of the way. Bake 18-23 minutes at 350F. (I had more batter left over and saved it for another use. Place each muffin upside-down on a plate and remove the foil liner. Drizzle with a caramel sauce if desired, or skip that and save a few calories. It is delicious without any sauce. Categories: Dessert - Fruit | Tags: Cupcakes, dessert, Pineapple, Pineapple Upside-down | Permalink. 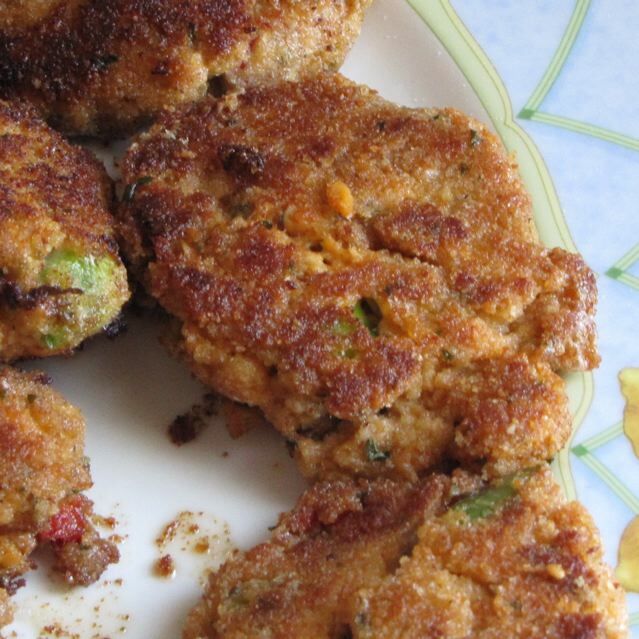 My family is not big on eating fish, but they always seem to enjoy these easy to make salmon cakes. I have made these for years now. I think I pulled it from an Chicken By the Sea advertisement in a magazine. They are delicious. I hope you try them sometime. The recipe for sauce is also listed, but I often serve them with store bought tartar sauce and a cucumber tomato salad on the side (Chopped and seeded cucumbers mixed with sliced tomatoes and dressed with bottled Ranch Dressing). In a small mixing bowl, combine chopped red pepper (I use the roasted red peppers from a jar) , green onions, mayonnaise, lemon juice, seasoned salt, and cayenne pepper. Taste and adjust seasonings to personal preference. Stir in egg, well drained salmon and 4 Tbsp of the breadcrumbs. Divide and form mixture into 6-8 balls (I use an ice cream scoop). Roll Salmon balls in remaining breadcrumbs; flatten into cakes (about 1/2 inch thickness) Fry salmon cakes in melted butter and oil in skillet over medium heat for 3-4 minutes on each side. Combine ingredients in a small bowl and blend well. Serve with Salmon cakes. Categories: Main Dish - Seafood | Tags: Salmon, Salmon Cakes, Seafood Cakes | Permalink. Pound chicken breasts thin (placing them in a ziplock bag so the juices do not splatter the kitchen). Place a piece of Swiss cheese (folded into smaller strips to fit) between two slices of ham slices and fold over the cheese to seal in. Wrap each breast around the ham and cheese “packet” . Fold the edges of the chicken over the filling, and secure with toothpicks. Dip the rolled and secured chicken breasts first in beaten egg and then coat in Panko (or other bread crumbs) to coat the chicken pieces. Heat the butter and oil in a large skillet over medium-high heat, and cook the chicken until browned on all sides about 10 minutes. Remove browned chicken and put in a baking dish. Cover with foil and place in 325F oven. Add the wine and bouillon and paprika to the pan. Mix the cornstarch with the cream and slowly add to the skillet, whisking constantly. 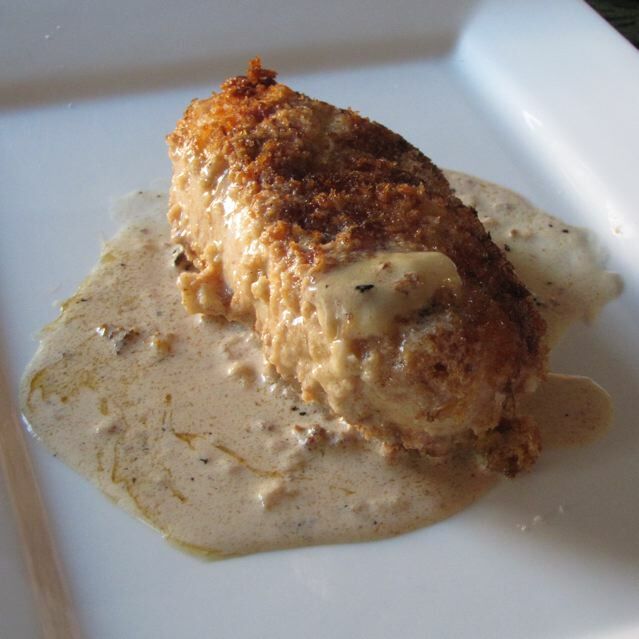 Pour the gravy over the chicken breasts in the oven and continue cooking for 20-25 minutes until the chicken runs clear. Remove the toothpicks. Serve with gravy.This dish pairs nicely with steamed broccoli. 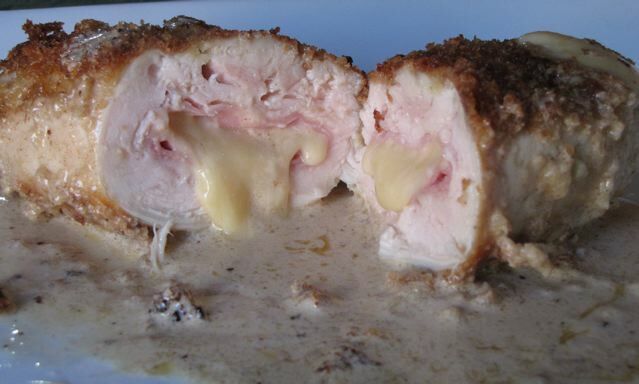 Categories: Main Dish - Chicken | Tags: Chicken, Chicken Cordon Blue, chicken recipe, Cordon Blue | Permalink.